Now that warmer, sunnier days are here, I’m finally gardening outdoors in real dirt. Potting soil and indoor spaces are great for starting heat-loving plants and for giving a jump to early season vegetables, but they don’t offer the pleasure of kneeling next to a bed of real dirt, moist from rain, rich with compost, warmed by the sun and ready for seeds. 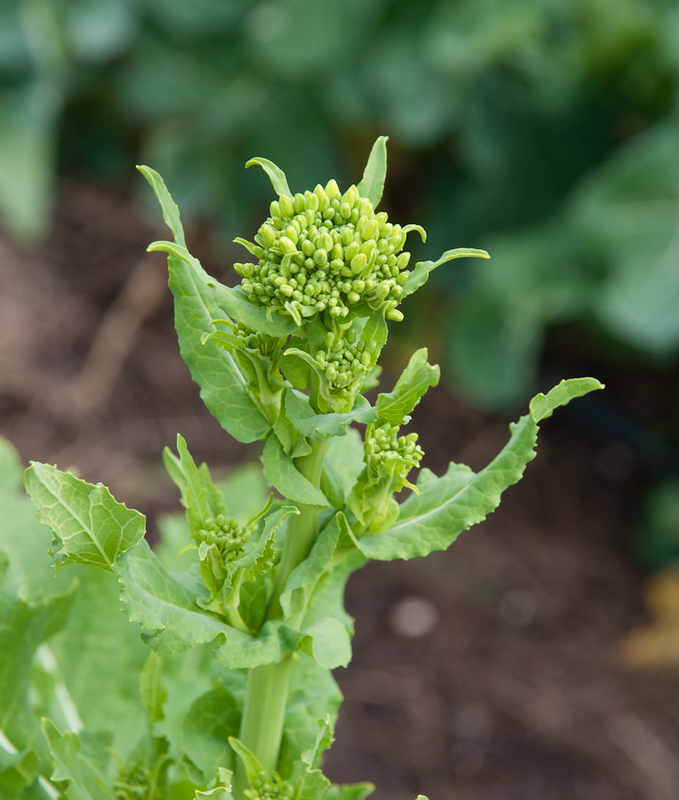 In late March and early April, I did set out sugar snap peas and a few starts of lettuce, radicchio, fennel, broccoli, and cauliflower and even planted a cold frame with short rows of radishes, turnips and lettuce, working quickly each time before heading back indoors. The air was still cool and the soil barely warm. But last Sunday, Earth Day 2012, was warm and sunny, my first real spring outdoor garden day. I knew what I wanted to plant—beets, carrots, chard, fennel, kohlrabi, turnips, radishes—so it took just a few minutes to pull the seed packets from their storage box, put them in a basket and head out to the waiting garden bed. I’d worked some compost into the soil the previous week so all that was left to do was to rake the soil level and smooth and attach the T-tape irrigation to the water line, stretching out the four long strips at one foot intervals on top of the dirt, a blank canvas ready for seeds. What pleasure sitting in the path pondering how to fill an open garden bed! Eighteen feet divided by seven vegetable varieties would give me seven two-and-a-half-by-five foot sections. The irrigation tape suggested four short rows in each section. That spacing would work for most of the seeds in my basket, especially because I’d be thinning out and eating plants as they started to grow. Should I plant the sections by height, by days to harvest, alphabetically, by contrasting foliage? Beauty trumped practicality as I imagined a pattern of beet leaves, carrot tops, chard stalks and fennel fronds alternating with the bulbs and tops of turnips, kohlrabi and quick growing radishes. Actual planting brings its own sequence of pleasures: cutting a shallow furrow in the dry surface to expose the moist soil below, opening the seed packet and shaking a few seeds into my palm, studying them for a moment, taking in their size and shape and how very small they are before dropping them into the furrow at regular intervals, covering them with a layer of dirt and patting the furrow closed. Beet and chard seeds are rough and ragged-edged, turnip and kohlrabi are tiny red or black balls, radishes are a little bigger, round and pink, carrots and fennel are the most seedy looking reminding me of cumin or caraway. Moving my way down one side of the bed and back up the other, I felt the sun warming my back. The golden, late afternoon light reminded me that this time of day is my favorite for planting. When I was done, the dirt looked like it did when I began but I knew what was beneath the surface. I spread a blanket of Reemay over the bed to keep birds and cats from disturbing the hidden seeds and to add a bit of warmth to the soil. Monday was sunny but Tuesday steady rain fell all day, a good soaking. 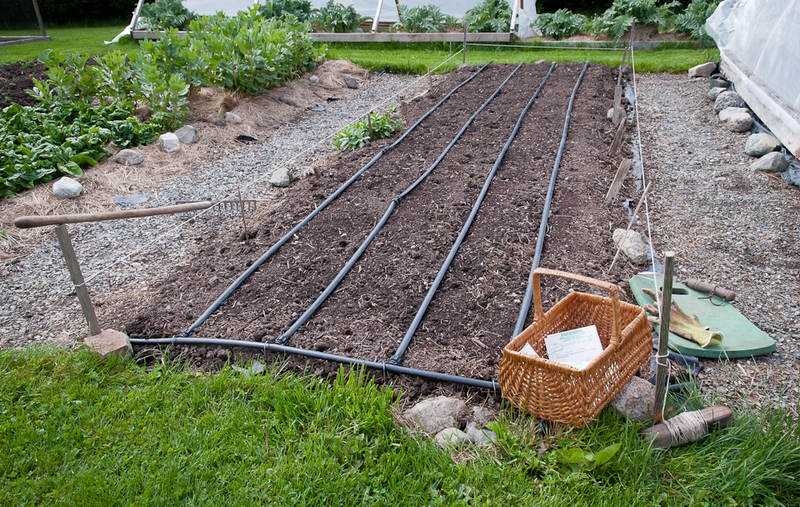 By next Sunday, there should be radishes pushing up through the dirt followed in a few days by turnips and kohlrabi, then later beets and chard and finally carrots and fennel. I’ll check each day for the pleasure of finding green shoots against the dark earth. In these early spring days of longer light and warmer temperatures, the winter kitchen garden offers one last treat before giving way to the next season’s plantings. 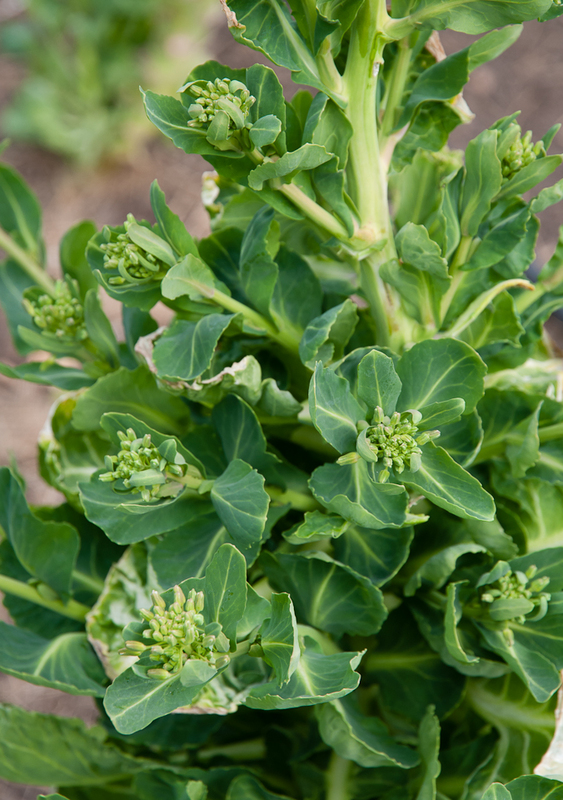 Kale, Brussels sprouts, the few remaining turnips and rutabagas all respond to the end of winter by producing flower heads, tight buds that resemble tiny broccoli. They are delicious! 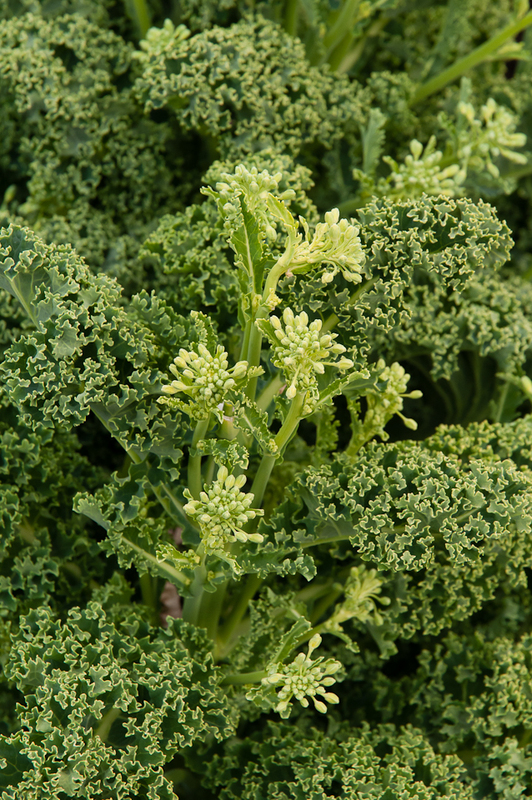 Kale tops are the most familiar but flower buds from other brassicas are just as tasty. Quickly wilted and then sautéed in olive oil and garlic they are a perfect farewell to winter and welcome to spring. 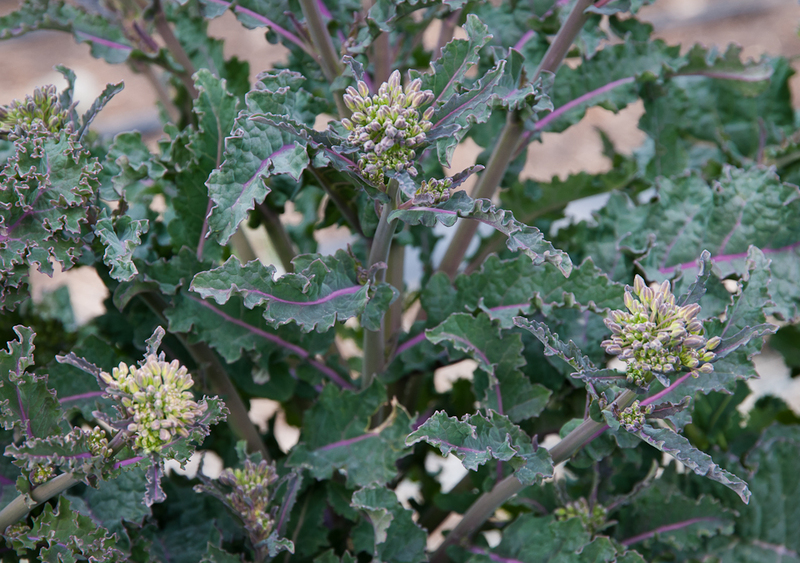 Winterbor kale flower buds Brussels Sprout flower buds Turnip flower buds Served on pasta with toasted breadcrumbs and grated Parmesan cheese these sautéed flower buds make the meal I most look forward to this time of year. 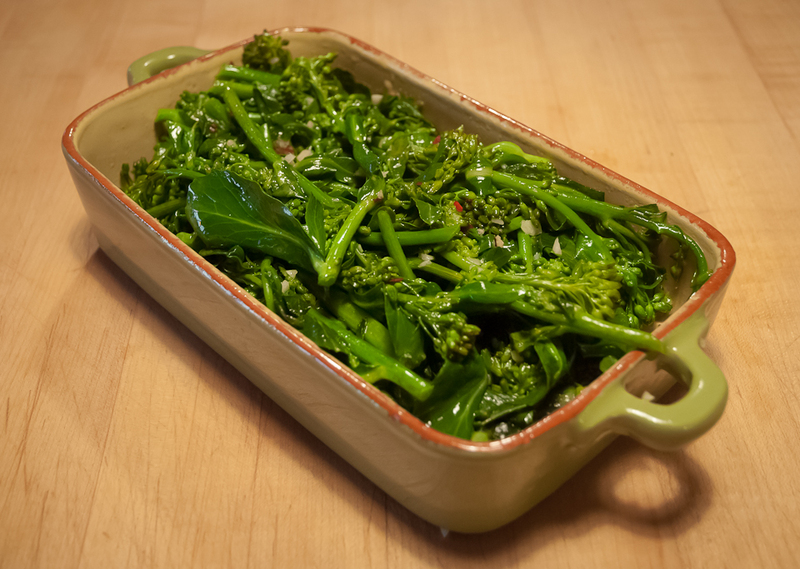 They are sweet and tender, like broccoli raab but not as pungent. 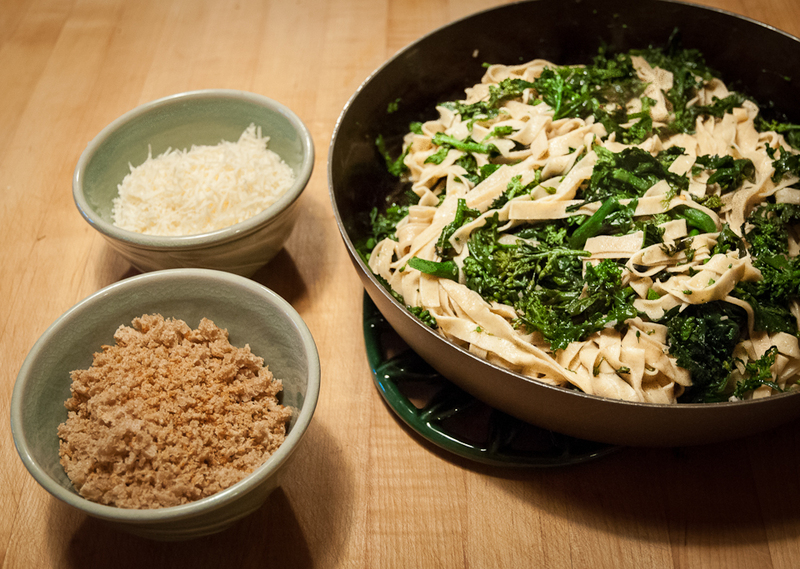 They come on fast and though I find myself imagining other ways to eat them, I’m just as happy to return to this favorite pasta topping or simply serve them sautéed as a side dish. Brussels Sprouts flower buds sautéed in olive oil, garlic and red pepper flakes I harvest these flower heads by slicing the stem two or three inches below the buds. First harvest stems are thick, a quarter to a half inch in diameter, and succulent; as the short season continues, the stems of side buds are smaller but still tasty. Those buds I don’t manage to pick open into yellow flowers, brightening the garden and attracting bees. If temperatures really warm up, aphids also discover the flower buds, making them less pleasant to pick and prepare. At this point, I reluctantly let them go, but in their place there are the first spears of asparagus and leaves of lettuce ready to harvest so I really can’t complain. 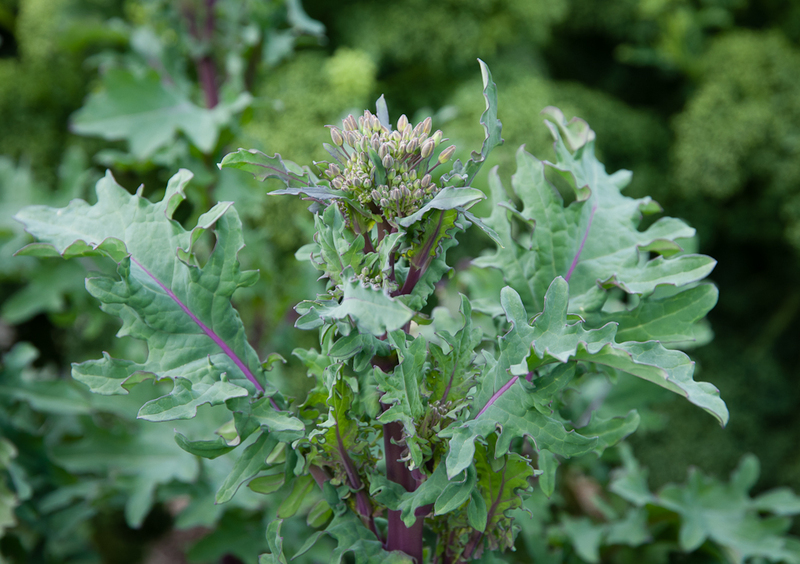 Kale, chard, spinach, endive, escarole, radicchio and arugula all grow well in my kitchen garden and find their ways into both salads and sautés all winter long. But these greens are all European. Where is Asia? Where are Asian greens and Asian cooking? The short answer is that I’ve never gone there, literally. What a shame! 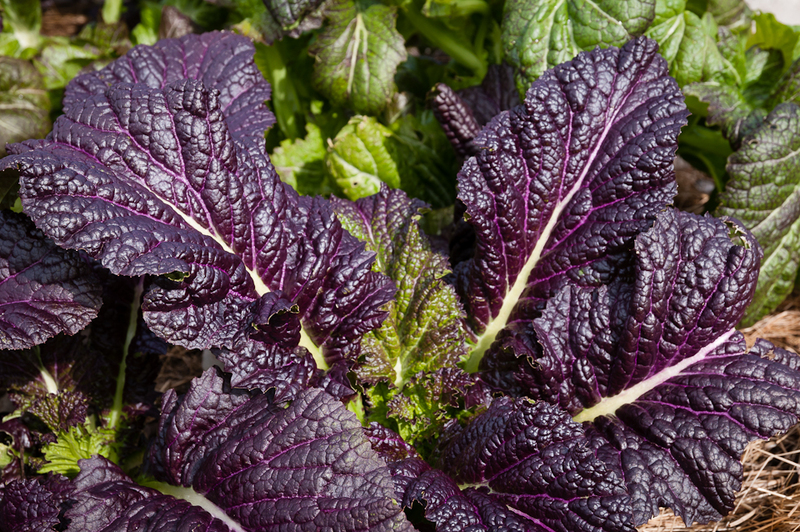 But there is one Asian green I’ve been growing the past few years that is slowly expanding my gardening and my cooking and may even expand my travel: red mustard. 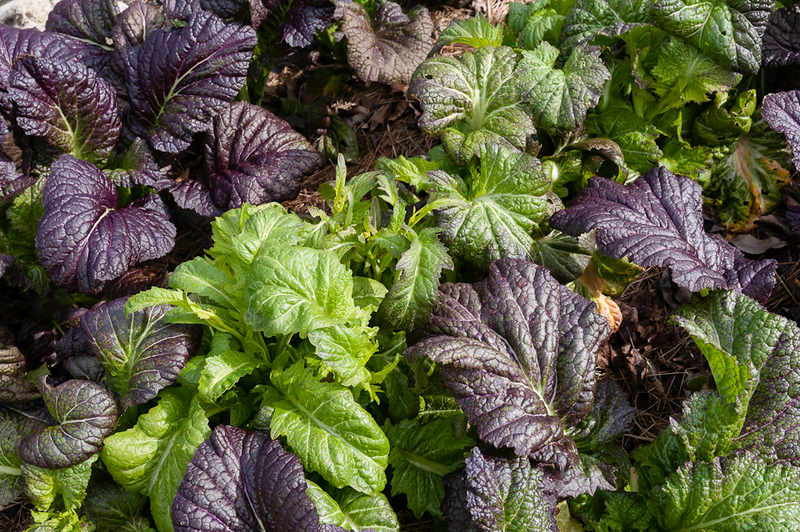 I started out planting mustards, both red and green, as salad greens, spicy jolts in mixes of other milder greens. Then luckily a fall planting of red mustard grew well beyond salad size into great large leaves, bigger than spinach, closer to chard size. 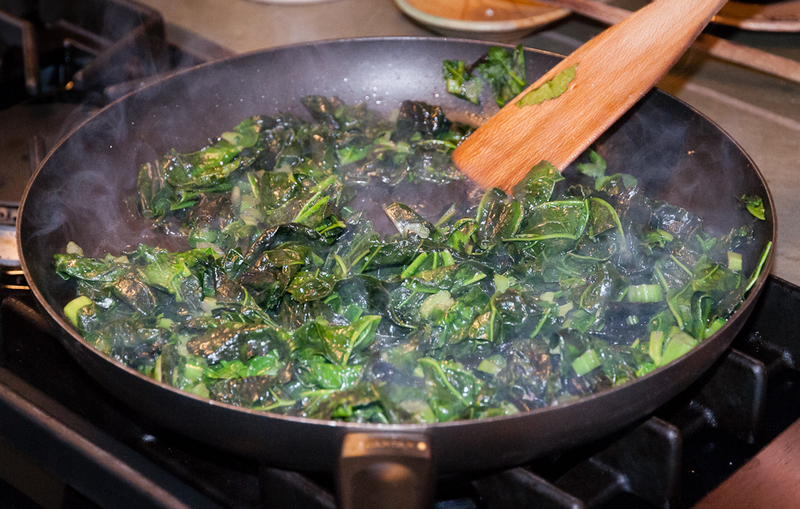 I still remember the winter afternoon when I opened Alice Water’s Chez Panisse Vegetables to Mustard Greens and recipes for wilted red mustard. After describing how to wilt red mustard in olive oil with a little shallot or garlic she writes: “One wonderful combination is to serve wilted greens with roast pork loin, fried apples and corn bread.” My note next to this advice says: “Yes!” This combination has been a favorite winter meal ever since. 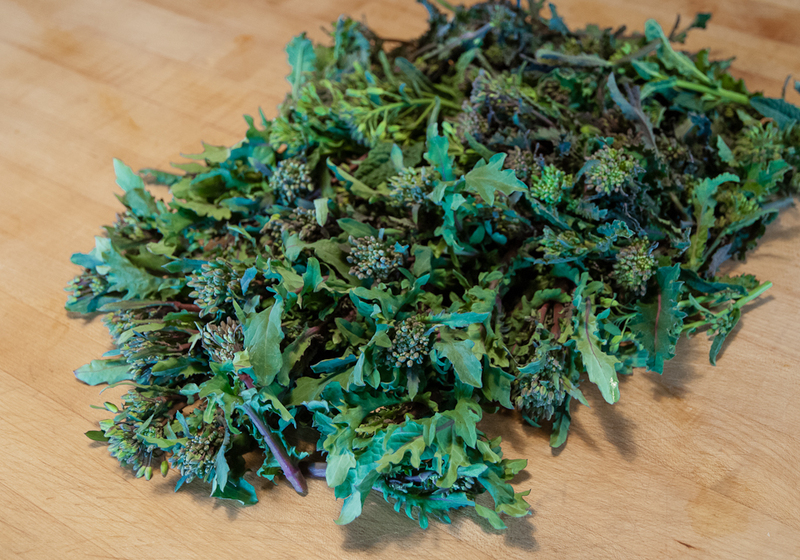 And even without pork, apples or cornbread, wilted red mustard is a wonderful winter and early spring side dish or main course. Its mustardy, peppery zing, almost like fresh horseradish is tempered, but not too much, by a quick sauté. The other day, I wilted some red mustard in oil and garlic and, when it was nearly done, shaped a shallow depression in the greens and poached an egg in the center. A perfect meal! 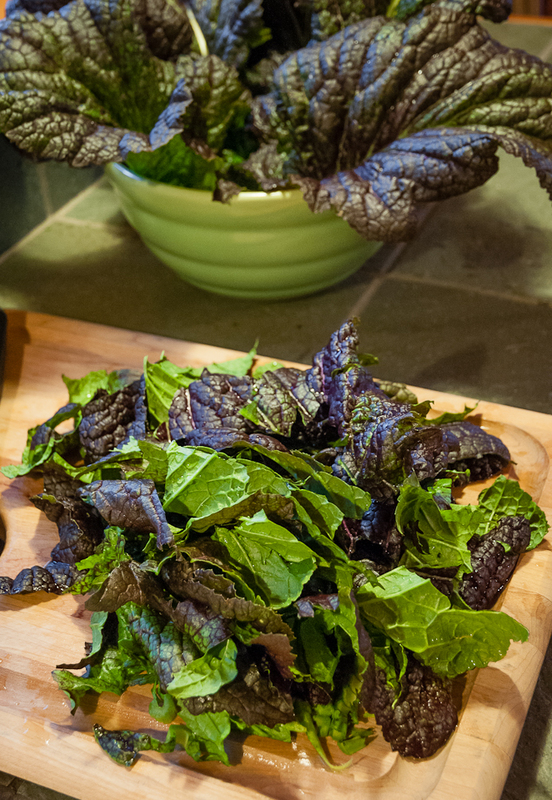 Last Easter, my friend Sally and I followed another Chez Panisse Vegetables recipe for red mustard, wilting the greens in olive oil and garlic, adding red pepper flakes and a splash of red wine vinegar and then wrapping the mixture in thin slices prosciutto and serving it as an hors d’oeuvre. Spicy and salty and very tasty! 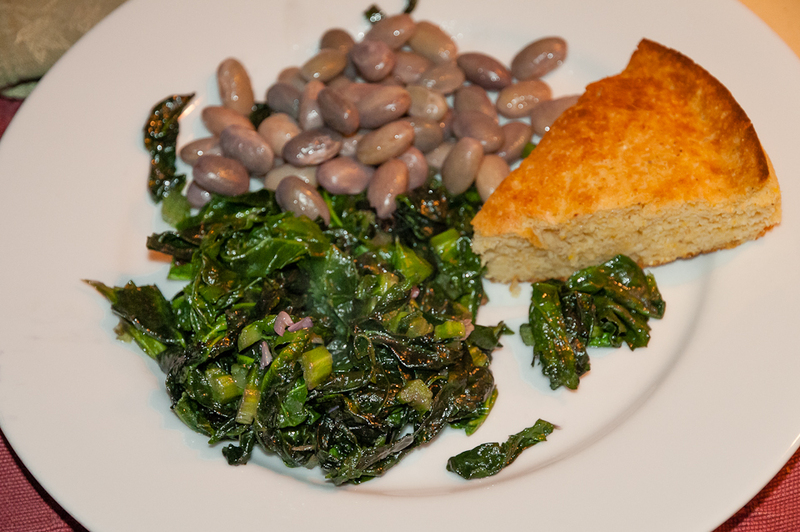 And here’s last night’s delicious simple dinner of wilted red mustard, shell beans and corn bread. All of these recipes are more European than Asian, I admit, but with a little recipe research and inspiration, I can head farther east. Nigel Slater’s Tender: A Cook and his Vegetable Patch has a truly inspiring section titled “Chinese Greens” that includes detailed descriptions of many Asian greens, helpful planting and harvest advice, and tempting recipes. I’m ready to add more Asian greens to the mustards. The mustard varieties I’ve grown so far are Red Giant and Osaka Purple. I plant them in late summer, August 9th and 24th this past year, in rows about eighteen inches apart, the tiny seeds about four inches apart. They germinate and grow quickly. When the leaves reach salad size, I thin the plants to about a foot apart and mulch them. They continue to grow and by October frosts they are chard size and ready to mulch more heavily. 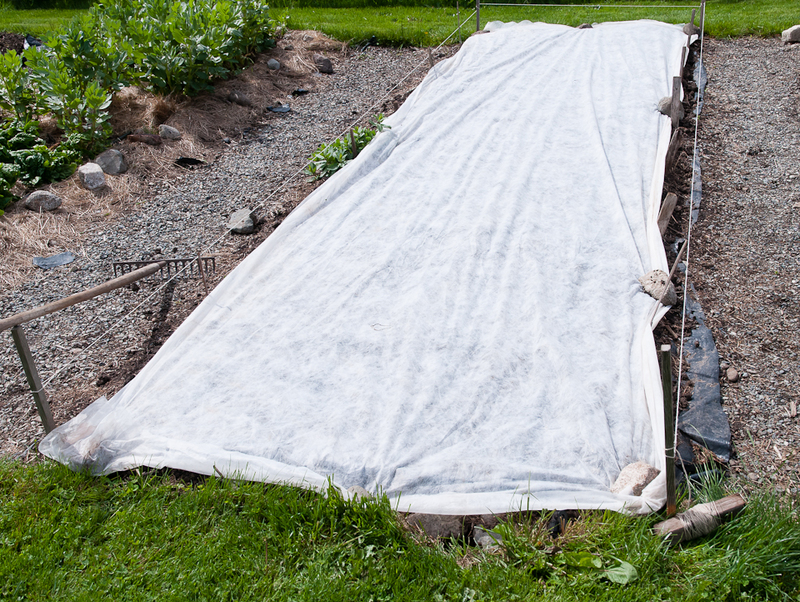 They survive winter temperatures in the low twenties and high teens if covered with a tarp or double layers of Reemay and continue to grow vigorously when temperatures warm and daylight increases. Many other Asian greens are also winter hardy so I’m adding them to my list for next winter’s kitchen garden. And as for Asian travel or at least some really good Asian restaurants? They’re on the list too.